If you follow me on Instagram then you will have seen the crazy picture of Fisher having actual “people food” for breakfast on Sunday. That’s because we found out the little booger officially has 6 teeth! My mother-in-law called me at work on Friday and noticed that he was playing with his ear – it was red, warm and he was grabbing at it. He was also fussy and seemed like he might be running a fever. I know, your probably thinking the same thing we both were – that he had a dreaded ear infection 😮 So, I called the doctor and they fit me in early on Saturday morning to get a look at the little guy. I left work in a rush to go pick him up so we could get home to cuddle and make it feel all better, but when I showed up at my in-laws, he seemed better??? He slept well that night and showed no signs of the symptoms he had during the day. We thought it might just be teething since he was getting his top, front teeth in. Teething symptoms can be very strange. However, we decided to keep our appointment at the doctor just to be safe. We were up bright and early on Saturday morning and off to the doctor. We settled into the exam room and played for a bit before Dr. Jen showed up. She took a look at his ears…all good; next, his throat…nothing there; then, to our amazement, she said…”aw, yep, that’s it – I would say he officially has 6 teeth.” “I’m sorry,” I said, “could you repeat that”? “Yes,” she said, “6 teeth.” We were shocked! To me, 6 teeth means more mature foods – things he can chew. So, we decided to make pasta for dinner that night. That didn’t go over very well…Then, we decided to try french toast and eggs for breakfast. Yummy…did he love that! 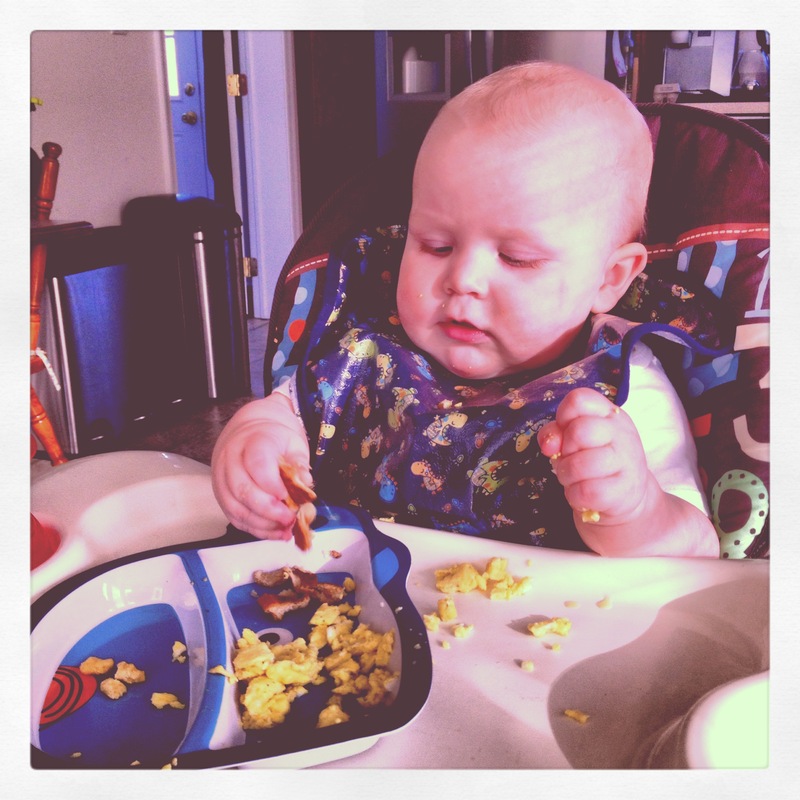 It was too cute watching his little hands pick up the french toast and mush the eggs between his fingers. What a mess! 6 teeth also means that my baby is getting bigger. I just try to remind myself…enjoy every moment, Alison, enjoy them all.